We’ve already got all the books we need, thanks very much. The nominees for the Washington Post Best Webcomic of 2010 are up, and waiting for your click should you feel so inclined. They sent a fair bit of traffic here last year, so it’s a good way to spread The Word, even if we don’t win (we won’t!). UPDATE: We’re also among the 6 finalists for a Riffy in the same paper. Vote for that too, if you feel so inclined. Much appreciated. Have I told you lately, that you’re awesome? Another strange inversion of logic. Wonderful. let’s take back al-andalus from the infidels! especially the beaches, yeah, take back those beaches from the, umm, from the german and dutch miscreants! wow, it’s scary sometimes how easy you make beleiver logic seem. i guess it shows how there’s many interpretations even of apparently nuetral events…. Nice strip. And a great book, if you can get your head around the biology of reason. Perhaps when Jesus is finished reading his book, he could next read some Meera Nanda? Yep, a great book, excepting “A Loophole for Torquemada?” and other bits of rank imperialism. Oh there are two places to vote? I voted for you in the Riffy – you’re slaughtering that. but in general, what kind of logic and/ or bibliophilia do you expect from an analphabet? You will be a runaway winner in both categories. Have sent the link to all members of my irreverent family. FWIW, those translated books would also have been sold in the much bigger market of South America, but that doesn’t affect the main point. I was wondering if the boys are actually holding those books open ‘cos they must have very long thumbs if so. Pharyngula endorsement seems to have put you ahead at WaPo. And those books which were translated into Arabic would have been limited to sales in only one Arabic speaking country? By the way, I never made it to the thumbs, my physiognomy disconnect arrived at the elbows. @jerry_w: just that comparing the Spanish-speaking to the Arabic-speaking market is the fairer comparison (and only detracts slightly from the conclusion that Arabs think they only need one book). I have an idea about the elbows and thumbs: could those arms actually be tentacles? Quick, somebody tell PZ! C’mon guys, the deep philosophy that you find here outweighs the poor artwork. I suppose if you want both artwork and philosophy you need to read Calvin & Hobbs. 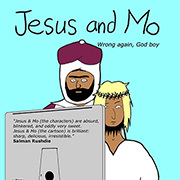 Jesus and Mo artwork is fine the way it is. Until the next art update, that it will be fine that way, too. What’s more, the GDP of the entire Arabic speaking world, with a population of about 360 million, is roughly equal (the metrics vary, mostly with the price of oil which is by far the largest part of the GDP) to that of Spain, which has 1/8 the population. And apart from petroleum, dried fruits and nuts, rugs and terrorism, I can’t think of much of anything else that the Arab countries export. Sand? @Stonyground: yes you’re quite right, and it wasn’t meant as a criticism anyway. This process has continued since that mass expulsion in March 2010. In some cases people who’ve been there for years have been thrown out. @MrGronk A great and compelling quote of Caliph Omar. Can you give me a source? I can’t find it online. Bottom line seems to be that the story about Caliph Omar cited above is not true. It seems to give full references for everything, including the quote. @European & Stephen: Well that’s a bummer. It ought to be true. @MrGronk Yes, it really ought to be true. Like so many things. Sigh. I feel your pain, but imagine how the YEC crowd must feel about things. Thanks @European and @Stephen Turner, but I’m kind of sorry I asked for that reference. 🙂 No I’m not. I’d rather know reality than live in illusion. Sincere thanks. Speaking of references, isn’t the reference regarding the claim that more books were translated into Spanish in a year, than Arabic in 900 years, only talking about books translated from English? Which makes it an unfair comparison. Not to mention that it is a lot easier to translate English into Spanish than Arabic. I agree with the wider point, but it feels a bit like it’s being used as an attack on arabs, rather than religion. Yeah, this comic feels like anti-arab racism. Do you think desperate poverty, widespread illiteracy and military/monarchical dictatorships with strict censorship laws might have something to do with the lack of translation? Oh, and those military dictatorships? All avowedly secular, or at least, they were, until popular Islamist opposition to them arose in the seventies and eighties, at which point they starting being more religious to co-opt the rhetoric of their opponents, who threatened to deligitmize and destablizie their regimes. “…could those arms actually be tentacles?”. Careful now Stephen, you’re wandering into FSM territory, and you know what a can of worms that is. Yes, but English is the lingua franca of science and technology. But we may well be being unfair to the Arab world in the above. Not to worry, Steven Weinberg to the rescue! The whole of this essay, “Without God”, is worth reading. @jerry_w: Oh no, I have blasphemed against the FSM! May His Noodly Appendage not smite me. That sounds very much like a personal judgement, rather than being particularly objective. Just because he did not like the thousands of scientific papers does not mean they did not exist. I was going to let Arkenor and EH’s insinuations of racism go as being unworthy of response, but finally decided it was best not to let them fester here unchallenged. What this comic does is quote a statistic and use it as a springboard to make a gag about the fundamentalist mind. It makes no comment on Arabs in general. Yes, the reasons for the discrepancy in the number of translated works are multiple and complex, but as religion plays such a large role in so much of the Arab world, it would be foolish to suggest it is not a contributing factor. And religion, not race, is the theme of J&M. I reject utterly the accusation of racism. Racism stems from ignorance and stupidity, and where it exists it should be challenged vigorously. But I have nothing but disdain for racism-sniffers such as these two, who feel comfortable throwing the accusation at anything they “feel” might be racist. They dilute the word through misuse – and they shouldn’t feel comfortable about that at all. EDIT: Looking back, I notice that Arkenor didn’t actually use the r-word (it was merely insinuated), so the above rant does not apply so much to him as to ‘eh’.